Social Media Marketing - Should you buy likes, followers and views? You are here: Home / facebook marketing / Social Media Marketing – Should you buy likes, followers and views? Social media marketing is a combination of tactics, luck and sweat. Gaining followers, friends, views and the like is not an easy task and sometimes you can wonder if all that time is worth it. I don’t think that buying likes and followers actually accomplishes anything in the true social media space. Psychologically I think there IS value to having larger numbers. I worry that those fakers you get could eventually count against you in the eyes of the social media services or your other “real” people. So there you have it, I am totally ambivalent so if you are looking for a yes or no, move on to someone else. If you want to become more confused (like I am) carry on as I break down each of these areas. This one is pretty obvious. If you buy feople (fake people) they will not interact with you at all. The providers of paid services are not promising that they will increase your influence or interact with you in any way, all they are saying is that you will have more numbers. That said, up until recently YouTube actually counted views as a measure of whether to promote your video on their search results so YES having more views made it more likely that you would get found more, more people would watch and there would be a beneficial spiral upwards. Additionally, if you are getting your Facebook business page posts shown to 4 percent of all the people (fake and real) there is a chance (however small) that someone will throw you a like and trigger a friendly uptick in your post being shown or shared. My besty, the Colorado Connector falls on the “what could it hurt” and “heck, it costs so little why not try it” side of this fence. I am totally on the “bah humbug” here. Looking at those two accounts, which would you be more likely to throw a follow to (as a real person?) I have to say that I am swayed by seeing someone has only a handful of followers, thinking that their stuff must not be that good or more people would like it. Now, what would you say if you found out that just last week, MandMMonsters (on which we post AMAZING marketing information only had about 150 followers?) For this piece I worked with a company that sells Twitter followers and had them provide us with 1,500 Twitter followers (they were not paid nor was I for writing this post, it just makes me curious so I thought I would take a peek at the numbers). This is the first time that I have used a paid service to get followers for any of my accounts (doing so generally violates the terms of service). That said, how it made me feel was somewhat compelling. These days it is not as easy to get followers as it was back in the good old days when I grew my Taradactyl Twitter account (I have 16,387 home grown, worked it and scrambled to get them for years). I understand the idea that if you post great stuff and interact like crazy, people will follow, like or view your stuff. BUT there is much more competition out there now than when I started and got the initial 6,000 or so that made me “popular” enough to keep getting more. We do social media marketing for clients and I am here to tell you, without some kind of critical mass to get you over the hurdle, it is scrabble, scrabble to get any traction at all. Additionally on Twitter there is a ration that says when you get to where you have liked 2,000 people, you can’t like anymore until you get 2,000 likes. We have one client who spent MONTHS trying to clear that hurdle and never made it. In the end she bought followers to get her over that and has continued to have trouble right up to today. As you may or may not know, at heart I am an SEO girl. I like that my blog gets search engine traffic and ranks well for terms I am targeting. Over the years, many people have said I was stupid for not buying backlinks, spamming directories or doing any of the other “black hat” tricks that could have made me even more popular. I could have had a shining month or year where I got tons of traffic…until…dum dum dum…Google penalized me for doing that! So many sites have been hurt by the Penguin and Panda Google updates that there is a whole industry built up around NOT using search engine marketing (because their sites have been banned for bad practices). I would rather have a “clean” site than hire comment spammers so why wouldn’t I want to have clean social media accounts. If Google could change the rules retroactively, why couldn’t Twitter. What if, from now on I have NO more paid for followers BUT it still hurts me in the end when they shut down my Twitter account? If this tool is out there you KNOW that Twitter can tell if you have dumped a bunch of followers in all at once. Thinking that they will not be able to track this is ridiculous. Maybe (because my account was not shut down) they have a level at which you have bought too many followers or you haven’t swung back around after to do real work on your account – just remember that buying followers is not the endgame, just a boost. The Taradactyl account was grown organically and shows a steady upward climb for the last three months. MandMMonsters is OBVIOUSLY not playing fair with a TREMENDOUS jump in followers all at once. One last thing to note…the ones you buy are not forever. They will eventually all get shut down or banned so don’t count on them to do all the heavy lifting for you. Use the boost to quickly follow other real accounts who might then be more likely to follow you back now that you look less lame. There is WAY more data (and interest on my part) about the mechanics of Twitter than Facebook or YouTube (their open API means that more developers have handy-dandy tools to check out your stuff). That said, the penalty for buying likes probably would be similar across accounts, the probability that they can tell what you are doing is high and the benefit still seems to be up in the air for me. 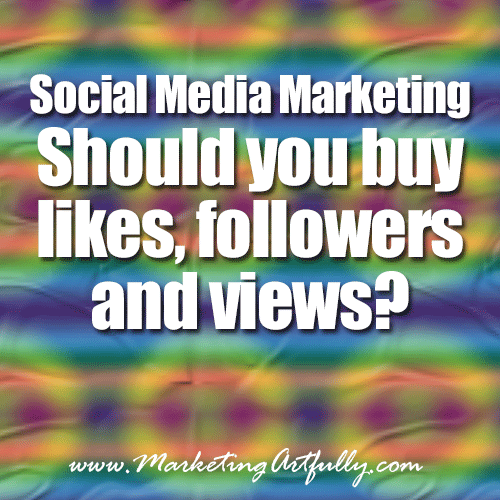 What do you think about buying likes, followers or views? PLEASE let me know if you have had success or crushing defeat one way or the other! I dunno, I can see both sides of this issue, as a business person who wants more followers, and as a customer who wants a “real” business person to work with, not someone who has fakers following. @Shell – I know right? I am more horrified to hear that they are fakers than I am to see that they have a small group of dedicated followers! I do agree with Tara! We know that there are fake accounts in twitter who are servicing other businesses and products as well. I contacted 1k followers from http://teamfollowpromo.com/ and they are gonna provide me tomorrow. I always ask one question myself that if these are fakes why twitter is not getting any action against them. They are deleting accounts and others are creating accounts. I think it’s all about business. Everyone has different views regarding social network but the unique and same is to be famous and well-known. We lost over 1,000 of the ones we got BUT in the meantime got a ton of “real” followers who were swayed by the fact that we had a lot of followers….such a weird and interesting game!